CAVE PAINTING ASIDE, POTTERY IS AMONG MANKIND’S OLDEST ARTISTIC MEDIUMS. BOTH FUNCTIONAL AND ORNAMENTAL, IT TELLS MYTHOLOGICAL TALES AND REVEALS QUOTIDIEN DETAILS OF PRIMEVAL LIFE. WHEN, IN 2012, ARCHEOLOGISTS UNEARTHED A 20,000-YEAR-OLD POTTERY FRAGMENT IN CHINA’S JIANGXI PROVINCE, THEY WERE FORCED TO RE-EXAMINE THEIR PRECONCEPTIONS ABOUT THE REGION’S EARLY CIVILIZATION. HANDMADE VESSELS, AFTER ALL, ARE NOT ONLY POWERFUL AESTHETIC OBJECTS, THEY ARE METAPHORS FOR THE HUMAN CONDITION: OUR BODIES, OUR JOURNEYS AND OUR LIVES. 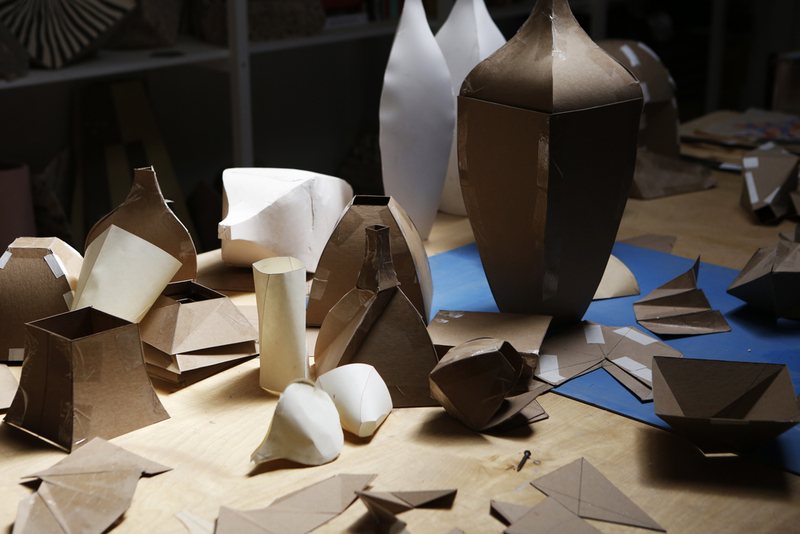 Today, Cody Hoyt progresses this age-old practice by crafting conversely geometric and organic clay vessels. Drawing inspiration from the ancient Japanese technique of nerikomi and Cody’s previous work as a painter and printmaker, the angular vessels recall their ancient ancestors: They stand as sculptural pieces while also serving as functional objects. And with each work, Cody continues to hone his process, pushing the limits of conventional slab construction and persistently evolving his unconventional surface patterns. WHAT IS THE FIRST THING YOU MADE, ART OR OTHERWISE? My handwriting assignments from first grade are beautiful poetry. I had a hard time keeping lowercase b's and d's straight. WHAT DO YOU CONSIDER TO BE YOUR MOST ADMIRABLE VIRTUE? WHAT WAS A DEFINING MOMENT OF YOUR LIFE? When I was 21 I did mushrooms and felt like I could see through of the subjective nature of reality and was temporarily de-conditioned. Feeling totally spent and exhausted but euphoric after working through something for a long time the studio. I'm confident my life would get a high approval rating. WHAT IS THE BEST PART OF BEING THE AGE YOU ARE NOW? I was born in 1980 so I grew up without computers or the internet. I like being an age that means my childhood was primarily analog and things were mostly mysterious, and my grown up years have an abundance of digital technology and connectivity. IF YOU COULD HAVE DINNER WITH ANYONE ALIVE, WHO WOULD IT BE, AND WHAT WOULD YOU TALK ABOUT? I guess I would choose Paul Rubens in character as Pee Wee. I would talk to him about magic, bikes and his hot dog tree. WHAT IS THE BUSINESS TRANSACTION YOU'RE LEAST PROUD OF? At an old job I used to spend my down time in the middle of the night making counterfeit change out of hard cardboard and using it to steal candy from the break room vending machine. I would draw a picture of Washington on each coin and write IOU on the other side. I'm ashamed of that now. My parents hung out with some famous people in Florida in the early 80s because my dad worked for the Allman Brothers. I've heard this story about a party where John Chamberlain allegedly got hammered and naked and cannonballed into the pool like a real wild man during the daytime with a bunch of kids and their parents.